The goal of this campaign is to get voter support for a ballot measure to extend the successful Community Preservation Fund in the five east end towns of Long Island and allow up to 20% of the funding to be spent on water quality improvement projects. Reflected wave energy from the geotextile bags will quickly erode the public beach. The motels were constructed many years ago on top of the existing primary dune, destroying that precious natural resource. This proposal will compound the mistakes made in the 1960s and 1970s: it will result in the destruction of the beach in addition to the already destroyed primary dune. A rock revetment was installed in front of the the Montauk Shores Condominiums at Ditch Plains during Winter of 2013, that not only restricted beach access but also accelerated the erosion of sand at Ditch Plains. The following summer for a period of time Ditch was closed to bathing due to the danger of rocks. It turned out that the rock sea wall violated the terms of the permit. Surfrider members incessantly called the Department of Environmental Conservation, who later determined that the sea wall was “significantly wider and higher than authorized.” The contractor was fined, and the revetment was scaled back. The Chapter has joined a large environmental coalition opposed to the Broadwater Liquefied Natural Gas facility proposed for the middle of LI Sound. Broadwater is opposed by all local state and federal legislators. The chapter has submitted comments in opposition to the Broadwater plan to FERC, the Governor, the NY Department of State and our legislators. After three and a half years of persistently expressing legitimate concerns, Long Island¹s voice was acknowledged! 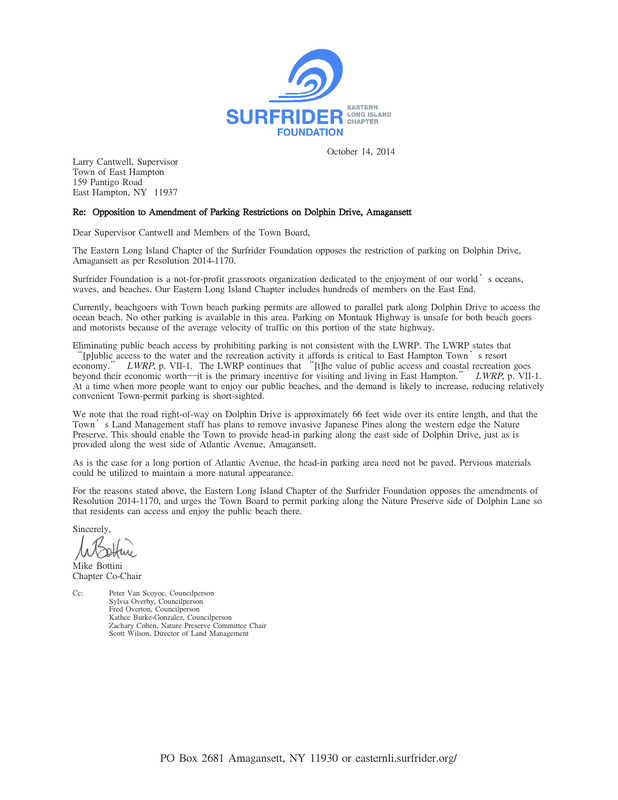 On Thursday, April 10th, Governor David A. Paterson formally announced that Broadwater was found to be inconsistent with the Long Island Sound Coastal Management Program (LISCMP) and thus should NOT be permitted in Long Island Sound.